Medium - $67.99 Only 9 left! What happens when a wizard, dwarf, a hobbit, and an elf go on a journey to Middle Earth? Well, an adventure ensues, that's for sure. If your crew wants to dress like J.R.R. Tolkien's band of mystical brothers, then you need to add Legolas into the mix, everyone knows that Legolas has more fun than any of his companions. Think about it, when is the last time you took down an army of orcs by climbing the back of a freakishly large battle elephant? Gimli and Legolas might be competing for kills but with this elf's wild unhinged moves, Gimli simply doesn't have a chance. It's not just Legolas's "fly by the seat of his pants" attitude that makes him legendary. His bow and arrow skills are unparalleled. He'll hit an orc in the head with an arrow from miles away. So, it's no wonder if you nabbed this character as everyone else was springing for the obvious Gandalf and Frodo. 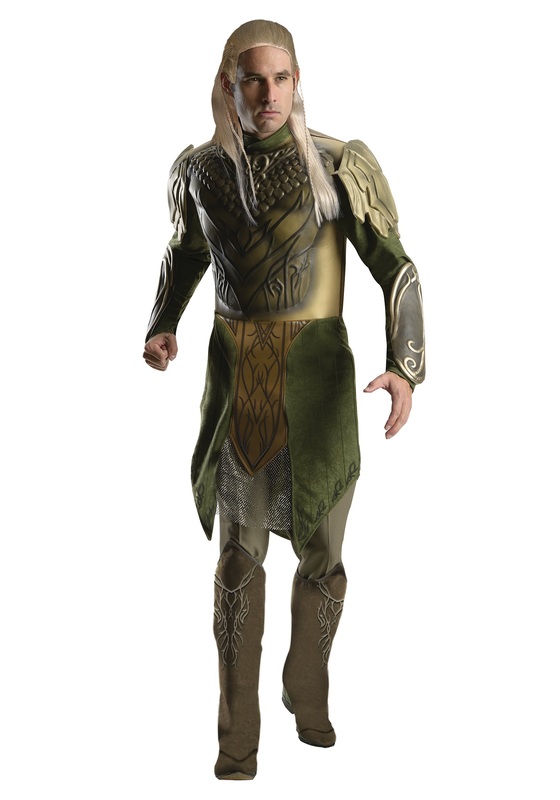 This Deluxe Adult Legolas Costume is an officially licensed costume that will make you look exactly like the "the Elvenking." This ensemble includes a lightweight molded shoulder armor with a 3-D geometric pattern and a gold metallic finish. The bottom of the tunic has a rich green color and gold center panel with a silver mesh underneath. You'll also get a pair of Elvish looking boot covers. Pair this costume with a silvery blond wig to make the look complete. Now, all you have to do is perfect those snarky Legolas comebacks!